Founded along the city walls and dedicated to one of the most effective plague saints on the calendar, this oratory built in 1614 was the headquarters of a pious confraternity that practised self-flagellation, similar to the Confraternità dei Battuti. 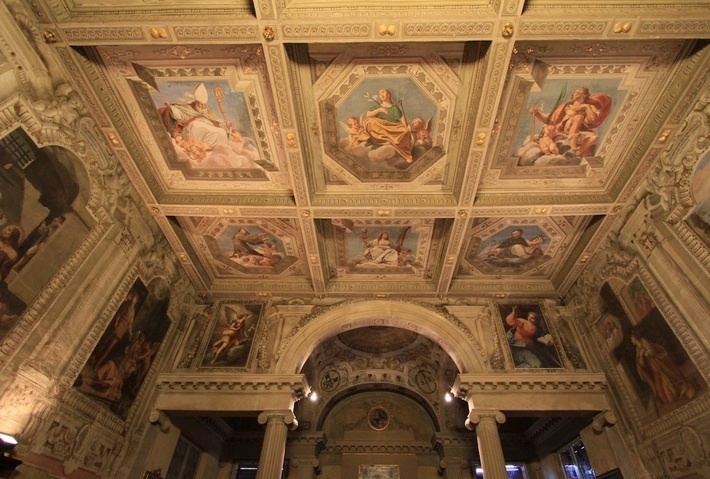 It was wealthy enough (many of the members were silk makers) to hire the top pupils of the Carracci to fresco the walls with scenes from the life of San Rocco; the figures of Bologna's patron saints and and Doctors of the Church on the casement ceiling were painted by Canuti and Colonna, among others. The confraternity was suppressed by Napoleon, and the Oratory spent many years empty; damaged in the war, it was restored in 1954. Today it's frequently used for classical music concerts by the Circolo della Musica di Bologna; check the website below for schedules. Hours Thurs 2.30-11pm; Sat by appointment; Sun 3-11pm. It's best to ring ahead.